The cost of new nuclear power has been underestimated by a factor of three, according to a British think tank. The New Economics Foundation (NEF) says existing estimates do not allow for the cost of building novel technologies and expensive time delays in construction. They claim that renewable energy sources like wind and solar should be relied upon instead of nuclear power. 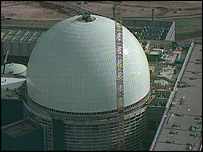 However their report has been dismissed as inaccurate by the Nuclear Industry Association (NIA). "This report is grossly out of kilter with almost all other reports that have been done," said Simon James of the NIA. According to British Energy and British Nuclear Fuels, the cost of nuclear generation is between 2.2 and 3.0p/kWh. But the NEF says that this figure is probably a severe underestimate, with the real cost being somewhere between 3.4 and 8.3/kWh. The NEF report claims that existing nuclear estimates are based heavily on "engineering judgements", which tend to be skewed towards the lower cost limits because they do not take sufficient account of "upside risk". In other words, the lower limits of cost are predictable but the upper limits might sky-rocket if things go wrong. And, the NEF says, current cost calculations for nuclear power do not acknowledge the very real risk factor involved in generating new nuclear power. In their report, Mirage and Oasis, the NEF highlights the example of Dungness B, a power station which took 23 years to complete instead of five, costing 400% above the predicted estimates. These hidden costs, combined with the risk of terrorism, mean that nuclear should not be promoted as an answer to climate change, the NEF claims. Instead, the report says, renewable energy sources like wind, solar and geothermal could meet the world's energy needs in a way that is environmentally friendly. At a cost of 3.0-4.0p/kWh for offshore and 1.5-2.5/kWh for onshore production, wind is a far cheaper option than nuclear, the NEF claims. "But a resurgence of interest in nuclear power, justified by voodoo economics, stands to hinder and potentially derail renewable energy," said Andrew Simms, NEF policy director. However, the Royal Academy of Engineers (RAE), who recently completed their own estimates of the cost of nuclear power, dismissed the report. "They are focusing on the worst-case scenario for nuclear power and the best-case scenario for renewables; so it is hardly a balanced view," an RAE spokesman told the BBC News website. "Too much of the debate at the moment is either nuclear or wind, when really we should be looking for a holistic approach."